<!--[if !vml]--><!--[endif]-->Alternate names: Radun and Радунь [Rus], Raduń [Bel, Pol], Radin [Yid], Rodin, Radunj township in Voranava district, Hrodna Voblast, Belarus. 54°03' N, 25°00' E, 8 miles N of Eisiskes, 16 miles NW of Lida, 45 miles SSW of Vilnius (Vilna). 1900 Jewish population: 896. LOCATION AFTER 1939: Baranavichy Oblast (Belarusian: Баранавіцкая вобласць, Russian: Барановичская Область) was a territorial unit in the Belarusian Soviet Socialist Republic created after the annexation of West Belarus into the BSSR in November 1939. The administrative centre of the province was the city of Baranavichy. The voblast was originally known as the Navahrudak Voblast but it was soon renamed to Baranavichy Voblast. The oblast was made up of 26 raions in 1944. These raions were Byten, Gorodyshche, Ivyanets, Iwye, Yuratishki, Karelichy, Kletsk, Kozlovshchina, Lyakhavichy, Lida, Lubcha, Mir, Masty, Navahrudak, Nova Mysh, Nesvizh, Radun, Slonim, Stowbtsy, Shchuchyn, Vasilishki, Valozhyn, Voranava, Dzyatlava, Zel’va and Zheludok. 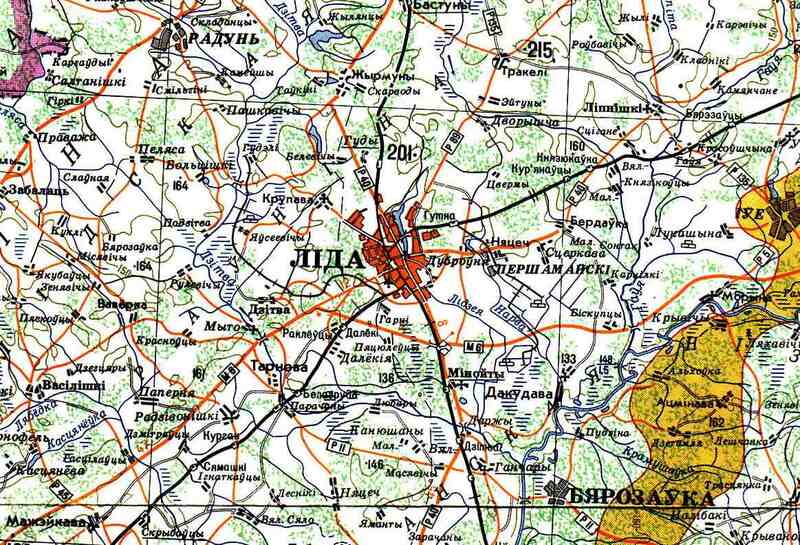 In 1944, the oblast was diminished after transferring raions of Lida, Radun, Schuchyn, Vasilishki, Voranava, Masty, Zel’va and Zheludok to newly founded Hrodna Voblast (Founded after remaining parts of Belastok Region to Belarus in 1945) and ones of Iwye, Yuratishki and Valozhyn to Molodechno Voblast in 1944. Finally on January 8, 1954 the oblast was liquidated and the raions were divided between the Brest (Raions of Gorodyshche, Lyakhavichy and Novo Mysh), Grodno (Byten, Karelichi, Kozlovshchina, Lubcha, Mir, Navahrudak and Slonim), Molodechno (liquidated in 1960) (Raion of Ivyanets) and Minsk (Raions of Kletsk, Nesvizh and Stowbtsy) Olbasts (Modern Brest Voblast, Hrodna Voblast and Minsk Voblast). Thus, Baranavichy became part of Brest one as raion center after Nova Mysh one's center was moved to Baranavichy in 1 May 1954 and renaming it as Baranavichy one after 8 April 1957. Today: Radun is in Voranava District, Hrodna Voblast, Belarus. First a Polish royal estate, Radun gained prominence in the sixteenth century due to its location on the main road between Cracow and Vilna. Jewish residency was prohibited until 1538 when local Jewish farmers saw Radun receive municipal status enabling them to remain. In 1623, the Council of the Province of Lithuania (Council of the Lands) subordinated Radun Jewish community to Grodno kahal. 1765 Jewish poll tax payers of Radin and its surrounding communities numbered 581. When Rech Pospolita (1795) was divided, Radunj became a part of Russian Empire and belonged to Vilenskaya Gubernya. By the end of the nineteenth century, the one hundred houses in the town proper had 283 Jews in 1847, 896 in 1897 (53.3% of the total population), and 671 in 1921 (53.5%). In 1869, Israel Meir Kohen (Hafez Chayyim after his famous Sefer) founded Radun’ Yeshiva there in 1869, attracting students from a wide area. The teacher of Talmud and Halakah was Rabbi Israel Meir Kagan (Pupko.) Primary occupations of the Radun Jewish community were commerce, crafts, and agriculture. Twelve percent of the two hundred Jewish cooperative bank participants in 1921 were farmers. The Yekopo Relief Society in Vilna granted nineteen loans in 1929 for 1,134 acres of land (420 desytinas). The pre-WWII Jewish population was about eight hundred. The Soviets took Radun in 1939, ending Jewish community activity. In 1939, it belonged to Belarussian Soviet Socialist Republic, Baranovichi district. This separated it from Eisiskes, which remained in Lithuania. The Nazi Aktion on May 10, 1942 murdered two thousand Jews from the town and surroundings villages. The August 9, 1942 Aktion killed most of the remaining Jewish population although some escaped to the partisans. The Belarussians reported that 1,136 citizens of Radun murdered by the Nazis. In 1962, Radun was in Voronovo District. Dugalishok, a predominantly Jewish village dependency of Radun that eventually became something of a Jewish resort, attracted numerous summer vacationers from the neighboring shtetlakh during the 1920s and '30s. The most illustrious of visitors was the Haffetz Hayyim himself, who brought with him many yeshivah students from Radun. Drawn to the countryside by the beautiful pine forest, the excellent agricultural produce, and the warm hospitality of the farmers, the young tourists kept the villages abuzz all during the summer months." (Eliach, Yaffa. There Once Was a World. Boston: Little, Brown and Company, 1998. P. 256. Incorporation papers location for two Landsmanshaftn for people from Radin: go to the JGSNY home page, click on "New York Landsmanshaftn and other organizations: & then scroll down to "Incorporation Papers".The town name is in the right column. Rediscovery Trip to Lithuania, including a stop in Radun by Rabbi Nosson Zev Grossman. Holocaust Martyrs in Radun compiled by the Soviet Extraordinary Commission. link to a browsable version. This list will be translated by the US Holocaust Memorial Museum and included in their massive translation of all the Extraordinary Commission lists, which will be searchable from Jewishgen. Holocaust in Radun on Yahad in Unum site. Yoseph Shlomo Kahaneman Rabbi studied at Radun Yeshiva, founded a Yeshiva in Israel. Rabbi Yisroel Meir HaKohen (1838 - 1933), the Chofetz Chaim, born in Zhetel, founded the Yeshiva of Radun, and was its first director. Rabbi Eliezer Kaplan graduate of Radun Yeshiva, murdered in Holocaust. Tzivia Walkin nee Sachrof, raised in Radun. Her family members were neighbors of the Chofetz Chaim. Her husband, Shmuel David Walkin, was rabbi in Traby before WWII. They fled to Vilnius and were able to leave there for Shanghai, where they spent the war. The Radin Collection at the University of Texas Briscoe Center has some of its pre-World War II photos online. Barbara Proko's translation of the Slownik entry. "In Ghetto Radun", chapter 26, There Once was a World, Yaffa Eliach, Little Brown, 1998, pp. 595-610. EVREISKAYA ENCY. : XIII: 272 [12 lines]. Yad Vashem: M.41-141 70632, Russian, 11 Nov, 1944: Accounts of battles and sabotage of the partisan group with the name MATROSOV from May to June 1944 in eastern Belorussia; information on the underground communist organizations in the region WASILIZKI from May-June 1944; establishment and actions of the partisan brigade by the name "Leninsky Komsomol" in the areas WASILIZKI, SKIDEL, RADUN in the years 1941-44; especially the condition of the Jews who remained in the family camps among the partisans. Shtetl Finder (1980), p. 83: "Rodin, Radin". Encyclopedia of Jewish Life (2001), pp. 1049-1050: "Radun".